Thomas Cup 2014 champions Japan find themselves in a potential minefield, alongside Chinese Taipei, Hong Kong and Germany, after the TOTAL BWF Thomas & Uber Cup Finals 2018 draw was completed in Bangkok today. Japan will expect some searching questions early on against group-mates that have depth in singles and doubles. The top two teams in each group at the end of the group stage will make it to the knock-out round. The draw in Thailand today was attended by, among others, the Japanese Consul in Thailand, Shigeki Kobayashi; the Indonesian ambassador to Thailand, Ahmad Rusdi; the First Secretary of the Malaysian Embassy in Thailand, Daniel Yap; TOTAL executives; officials of Badminton Association of Thailand, and media. 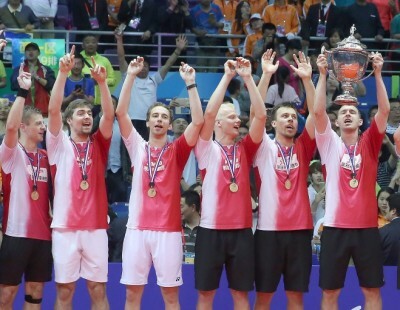 Defending Thomas Cup champions Denmark will have to contend with Malaysia, Russia and Algeria in Group D, while top seeds China, who will look to reclaim the title they last won in 2012, have India, France and Australia in Group A. Hosts Thailand are in tricky Group B with Indonesia, Korea and Canada, while in the Uber Cup too, Thailand are in Group B with Chinese Taipei, Germany and Hong Kong. In the Uber Cup, top seeds Japan, who will fancy their chances considering strong performances by their singles and doubles pairs in recent times, will look to top Group A that includes India, Canada and Australia. Defending champions and second seeds China will seek to maintain their stranglehold over the Women’s team title; their group challengers are Indonesia, France and Malaysia in Group D.
Korea, the only Uber Cup winners apart from China in the last two decades, are in Group C with Denmark, Russia and Mauritius. The Thomas & Uber Cup Finals will be held 20-27 May in Bangkok.